Playing on our love for WALL-E, our amazement for the Pixar Lamp and some great animation, Chris Smith, an employee at NASA Goddard Flight Center, has given the upcoming Solar Dynamics Observatory a personality. Apart from obviously having too much time on his hands, Smith is a very talented guy (as all NASA employees are) and is showing that, once again, the space agency is doing a fantastic job of reaching out to the public. As proven by the efforts of the Phoenix Mars Lander team in 2008, communication goes a long way and by harnessing social media, NASA can make its missions household names. Phoenix was tweeting, blogging and podcasting to its hearts content for five months, from touchdown to frozen death; it was Big Brother for robots living on Mars. Now most NASA missions have Twitter feeds and devoted blogs, ensuring everyone’s interest is piqued. It also helps to have a Twitter feed talking in first-person, giving these brave rovers, landers, orbiters and probes a much needed personality. And so NASA should, I like it! It’s going to get people interested in a comparatively small mission, and let’s face it, the satellite lacks character (the boxy 4-eyed robot doesn’t do much for me). However, now that Smith has added squeaky solar panel wings, and blinking “eyes” (without changing the design of the craft at all), he’s boosted the SDO’s likeability. Suddenly I care for the little guy. I hope he doesn’t get hit by a solar flare. 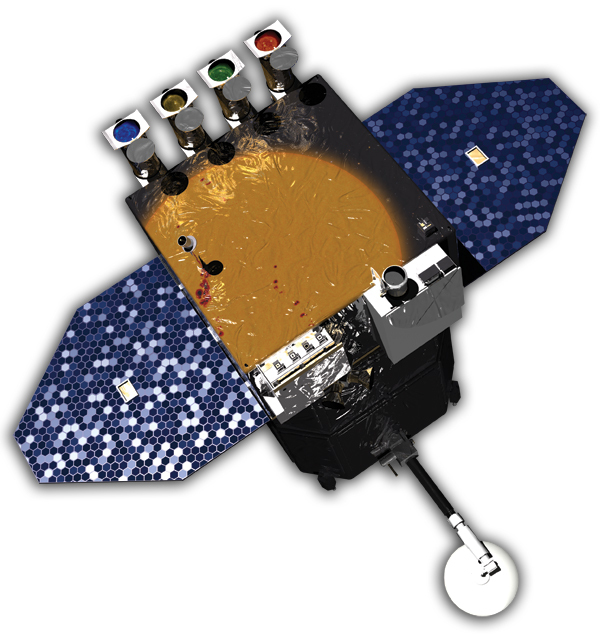 Due for launch in October, the SDO will be inserted into a geosynchronous orbit above New Mexico, gathering data from the Sun, so solar physicists can better understand space weather. The cool thing is that with those four eyes, the SDO will capture high-definition images of the Sun continuously. It might not have the dazzle of the Phoenix Mars Lander, but it has a personality and people will love him (I await the Twitter feed).